The decision by the Pentagon to bring charges of desertion and misbehavior before the enemy against former Afghanistan prisoner of war Bowe Bergdahl is vindictive and politically reactionary. Its purpose is to intimidate rank-and-file soldiers who, like Bergdahl, turn against the savagery of the wars American imperialism is waging in the Middle East and Central Asia, or who oppose future American wars around the world. Bergdahl, a private first class near the beginning of a yearlong tour of duty in Afghanistan, walked away from his unit in Paktika province in June 2009. He was captured by the Taliban and held as a prisoner, often under barbaric conditions, and forced to participate in propaganda videos. The Obama administration negotiated his release last May as part of a prisoner exchange in which five long-held Taliban prisoners were allowed to leave Guantanamo Bay. While the American media and the ultra-right have long peddled myths about Vietnam War-era POWs in an effort to retrospectively justify that imperialist bloodbath, these same elements immediately launched a campaign of vilification against the sole Afghan War POW upon his return home from captivity. Former members of Bergdahl’s unit played a prominent role in these efforts. There were claims—all later proven false—that Bergdahl had left his unit in order to join the Taliban and fight on their side, and that as many as a dozen American soldiers had been killed in the course of fruitless efforts to find and rescue him in the months after his disappearance. At the height of this campaign, the Wall Street Journal published a commentary suggesting that Bergdahl should face the death penalty for desertion under fire in wartime. In response to the right-wing campaign against Bergdahl, the machinery of the Pentagon began to grind out the mockery that passes for “military justice.” Lt. Gen. Kenneth Dahl interviewed Bergdahl and other members of his unit and filed a report with the top brass. Last week, Gen. Mark Milley, head of the Army Forces Command at Fort Bragg, North Carolina, authorized charges against Bergdahl. A preliminary hearing is set for April 22 to determine whether to order a court-martial, accept a negotiated plea, or dismiss the charges. This might have been a violation of military discipline, but it hardly warrants the charge of desertion. 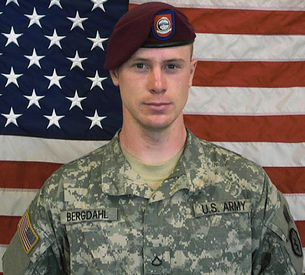 The vendetta against Bergdahl reveals two interconnected political facts. First, the military brass is determined to make an example of the former POW because, in addition to popular opposition to the wars in the Middle East and Central Asia, there is increasing turmoil within the ranks of the military itself, as the Afghanistan War approaches its fifteenth year and the war in Iraq is resumed twelve years after the US invasion of that country. Second, the Obama administration, which initially hailed Bergdahl’s safe return as a diplomatic triumph, to be celebrated with photo ops with the POW’s parents in the White House Rose Garden, takes its lead from the Pentagon chiefs. It is the military-intelligence apparatus, not its nominal civilian “commander,” that calls the shots in Washington. Behind the vendetta against Bergdahl is the fear of a Vietnam War-like growth of demoralization and opposition within the ranks, under conditions of a continuous escalation of US military operations, not only in the Middle East, but directed increasingly against major powers such as Russia and China.